If you are following the progress of the body positive movement in the fashion industry, you will be familiar with Charli Howard and Clementine Desseaux. Charli is a UK-based model who essentially told her agency, and the rest of the the narrow industry beauty standards, to go eff themselves after being told to lose weight. Her story went viral, and she was thrust into the body positive spotlight as a woman who isn’t afraid to rebel against the status quo. The reason for leaving her agency and putting them on blast was not just for her own benefit, but it was a recognition that these are the kinds of standards which trickle down into everyday society through magazines, online media, and more and have a major impact on the self-esteem of young girls who don’t fit the “norms”. Clementine Desseaux made headlines after becoming the first plus size model to be chosen to model for Christian Louboutin’s lipstick range, making a huge statement about how France, one of the fashion industry’s epicenters, is taking heed of the change. These two badass women have teamed up to take their message of rebellion to the next level, by launching the All Woman Project. The mission of the campaign is to empower women with their message and visuals, and hopefully disrupt and dismantle the industry’s definition of beauty. They want to end the body segregation and show what it’s like when women of all different shapes and colors exist together. Ya know, like in the REAL world! “Women are often segregated or stereotyped in fashion and the media; some are deemed the ‘real’ women of the industry, whereas others are deemed “high-fashion” and editorial. Your body shape shouldn’t define your femininity or ability as a woman! We believe size or color doesn’t limit us as models or as women. We believe all body shapes and ethnicities deserve to be represented in fashion and in the media, helping girls worldwide feel positive and confident about themselves,” says a description on the website. It’s also about allowing women to understand their worth does not solely come from their physical appearance. “The All Woman Project illuminates the idea that all women are more similar than we’re made out to think. We all have physical flaws and imperfections, and that does not make us more or less beautiful. Rather than retouching or shying away from them, we should embrace them. Our physical attributes do not define us as women; our strength and character does. All of this make us all woman,” says the description. 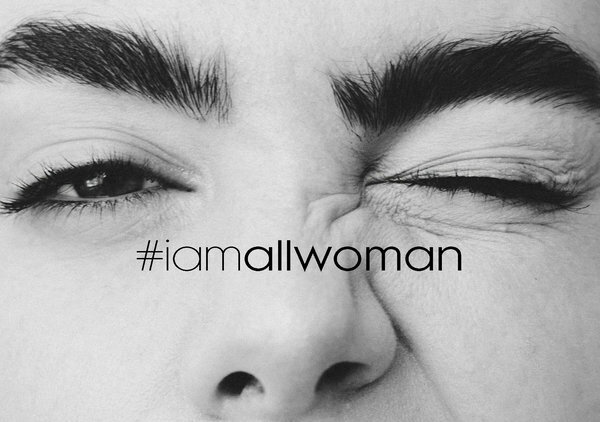 They are encouraging women who believe in this message to spread it far and wide on social media, using the #Iamallwoman on Instagram and Twitter. On the campaign’s website you can already see just how many women are on board with this movement. Clementine and Charlie gathered a group of models, some whose names you might also be familiar with, for a photoshoot. Denise Bidot, Iskra Lawrence who is the face of Aerie Lingerie, Kamie Crawford, Elliott Sailors, Victoria Brito, Shivani Persad, and Barbie Ferreira who is also part of the Aerie family, shared their own statements on the website of what it means to be part of a campaign that celebrates diversity, individuality and body acceptance. In a statement shared by The Huffington Post, Clementine explained that the shoot was completed without any photoshop because they wanted to show realistic images with their audience. “Rather than Photoshopping our bodies and our ‘flaws’, we’ve chosen to highlight and embrace them. We may be models, but we all have cellulite, stretch marks and other flaws that make us women, but which society teaches us to be ashamed of. This campaign is designed to unify women around the globe,” she said. And in the spirit of female empowerment, this campaign was entirely styled and designed by an all-female team. The photographers were Lily Cummings and Heather Hazzan, who took close-up photos of body-parts on some of the women. The images are beautiful, empowering, and much-needed. We think these close-ups are a big f*** you to the damaging messages that teach women to hate their thighs, their cellulite, stretch marks, wrinkles, body hair etc. They also teamed up with a social media platform called Clapit which was co-founded by a woman. The makeup used was Glossier, a female owned and operated brand, and the swimwear was luxury label Phylyda, also founded by a woman and designed to enhance the female form rather than hide it. The videographer was Italian Countess Olimpia Valli Fassi, known for her work with Nike as well as projects in Italy that discuss human’s rights, women’s rights and political issues. You can already see far more diversity in this campaign than most mainstream fashion campaigns we see today, and we hope to see the All Woman Project take this even further to include differently-abled bodies as well as women of various ages. In an interview with Today.com, both campaign founders expressed that although diversity is key, normalization is their goal. They both grew up not seeing women who looked like them in magazines and in fashion, so they want to change that for younger women. “Growing up, we didn’t have role models in media and fashion. It was never, ‘Oh, she looks different. She looks like me!’ Everyone was so skinny and white and perfect,” said Clementine. “I very much grew up in this size-zero era. As a teenager, you’re so influenced by things, and that’s what we saw,” said Charli. When campaigns like this become obsolete, we will know the body postivity movement has won. It shouldn’t be the case that the fashion and beauty industry only represents a small percentage of the world’s population, yet expecting ALL women to aspire to be something that is physically impossible for most. If women like Charlie, Clementine and the rest of the All Women Project crew can help shift attitudes in the industry to recognize the need to include everyone in their messaging, it will be a win-win.